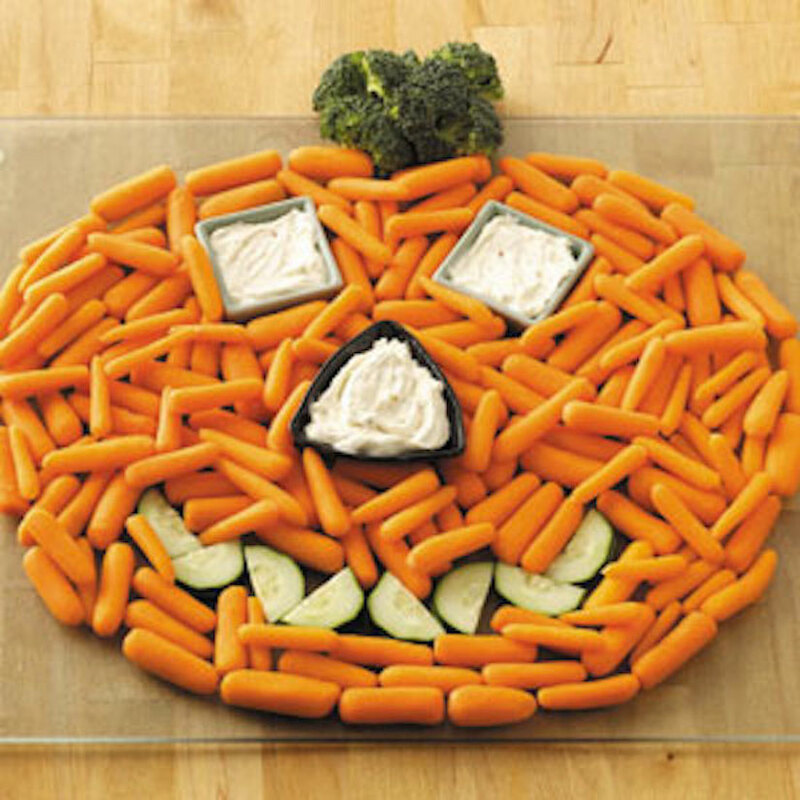 We are getting ready for Halloween with these 5 Healthy Halloween Fun Food Ideas. Creative and healthy ideas your family will love. Halloween doesn’t have to be only about eating candy. You can create delicious and healthy treats and have fun with the entire family. It is the perfect way to encourage kids to eat more fruits and veggies. I collected some fantastic ideas for a happy and healthy Halloween from the internet. If you want more fun food ideas for the holidays, check out my Thanksgiving Fun Food Ideas. 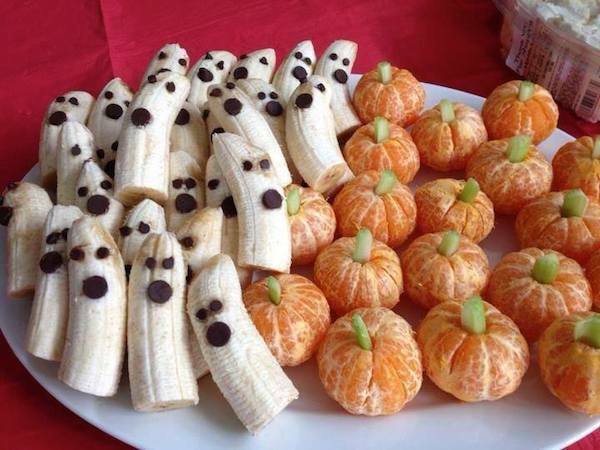 This is my favorite of the 5 Healthy Halloween Fun Food Ideas. It is easy to make and so much fun to eat. Serve this fruit tray at any halloween party. You can use celery stalks or pretzel sticks for the tangerines also. For the banana ghosts, use mini chocolate chips for the eyes and regular chocolate chips for the mouths. Always a big hit! You can also serve the bananas on Wooden Treat Sticks . A little lemon juice on the bananas will help keep them fresh for several hours. You can find cool Halloween Serving Dishes at Amazon. Healthy and very easy to make. Just use baby carrots, cucumbers, and a broccoli floret to shape your pumpkin. You can use small dip containers for the eyes and nose. That’s it! No cooking required and ready in less than 10 minutes. It is the perfect finger food for your Halloween party. If you want to serve more finger foods, you can make your own dips with some homemade crackers. Check out this recipe Homemade Cheddar Cheese Crackers and make them with only 4 ingredients. Make sure you also use a Halloween Mini Cookie Cutter Set to make it more fun. 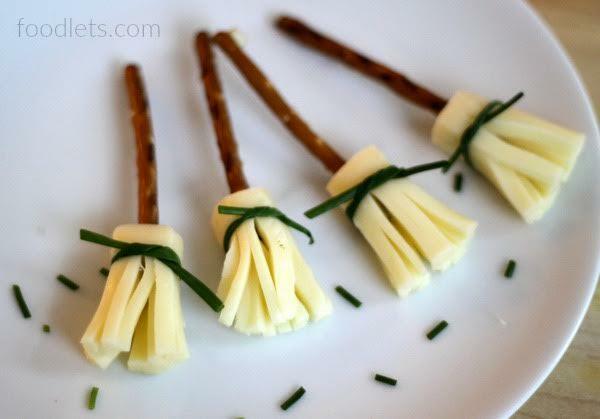 Make super cute broomsticks with pretzel sticks, string cheese, and chives. Cut each string cheese stick in half. Carefully press a pretzel stick into the uncut side of each cheese stick about 1/2 inch deep. Make the bristles. Using sharp scissors, cut thin slices that are about 1 inch in length. Gently tie a chive around the top portion of the string cheese and snip off the long ends. Serve it in a spooky Halloween Spider Web Round Melamine Platter . In a large bowl mix your favorite salad ingredients and dressing. You can also make a fruit salad. To carve a pumpkin cup, slice off the top of the orange, using a knife to loosen the edges, scoop out the inside of the orange with a spoon. Toss the juice in with your salad. 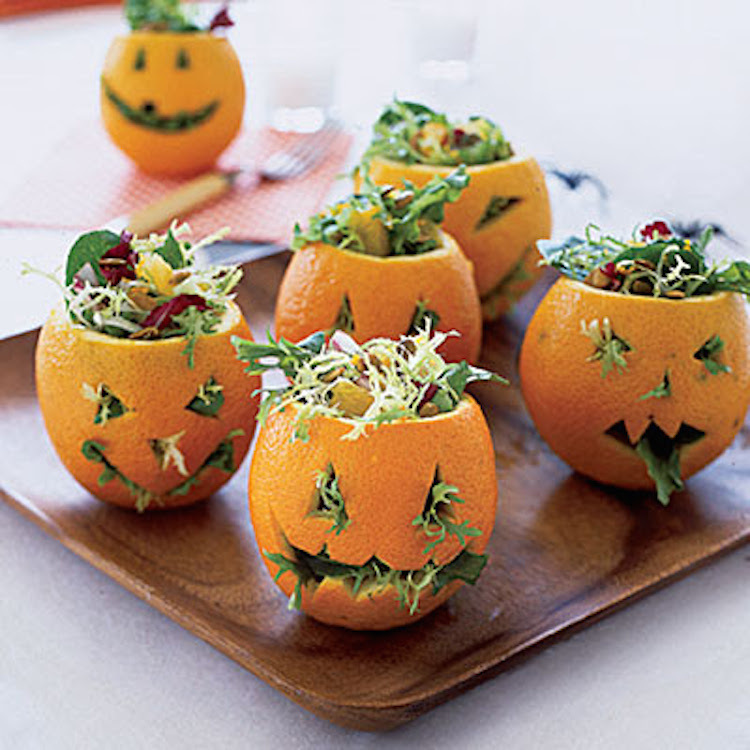 Carve a small jack-o-lantern face in each orange and fill with your salad. 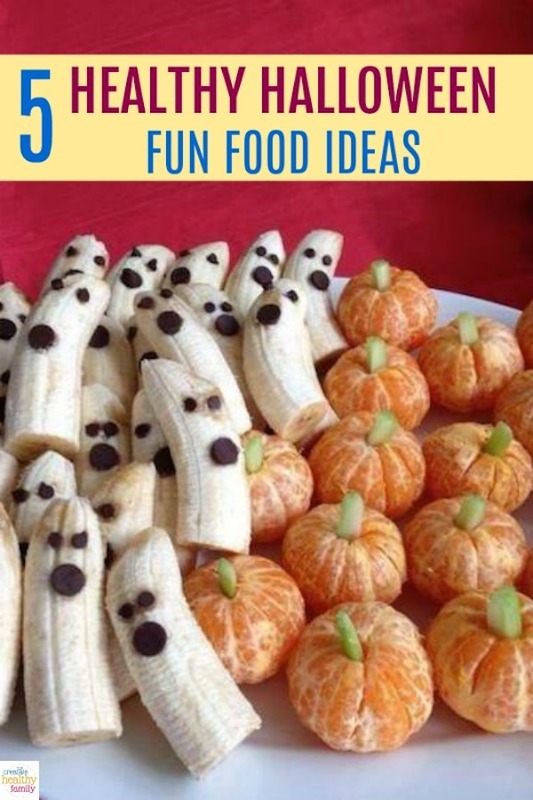 The coolest of the 5 Healthy Halloween Fun Food Ideas in my opinion. If you are making a fruit salad you can also use fun Mini Halloween Cutter Set to cut your fruit. What about these Halloween Boo Scary Words Luncheon Napkin for your party? You can make these mummies with whole wheat english muffins or small round pita bread. Heat the oven to 350º F. A toaster oven will work too. 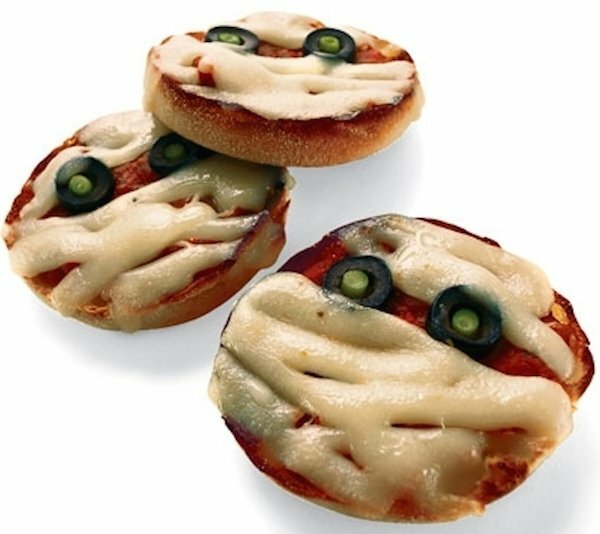 For each mummy, spread a tablespoon of pizza sauce onto half of an English muffin or pita bread. Cut olive slices in for the eyes and green onion or pepper for the pupils. Lay strips of cheese across the muffin for the mummy’s wrappings and bake for about 10 minutes. Make sure the cheese is melted and the bread is toasted. For another healthy halloween treat see my post, Homemade Healthy Gummies and use a cool Halloween Silicone Mold . You can also make Olaf ‘s Cheese Pizza if you want to add some fun and creativity to your meals. I hope you enjoyed my 5 Healthy Halloween Fun Food Ideas post and get inspired to create fun food this Halloween. I am a mom blogger who loves to share tips and ideas for a healthy family lifestyle. These are lovely ideas, thank you! Some very cool ideas. Food looking like this will really encourage children to eat it all !! You are so true “Haloween doesn’t have to be only about eating candy.” Very nice ideas and easily replaceable with all unhealthy snacks. I always try to give my kids healthy snacks.Great post! Healthy snacks are really what kids need. Thank you! I love all of your ideas. They’re all super cute and easy to make! The Pumpkins and Banana ghosts are super cute! Thanks for sharing. I can’t wait to try and make some of them with my son. The pumpkins and banana ghosts are my favorite! My kids love them! These are all absolutely brilliant! I’m hosting a pre trick or treat party and refuse to give them loads of sweets and chocolate beforehand and these are just perfect. Thank you!!! So cute!! Love the healthy options! Could be great for adult Halloween parties, too! Yes! Great for kids and adults too! This was such a cute post idea! I don’t typically celebrate Halloween, but I’n definitely going to try out those Banana Ghosts anyway! Thank you! Glad to know you liked the ideas ???? Love having fun and healthy options around the house. My kids will go crazy over mummy pizzas and ghost bananas! These are adorable!! I especially love the tangerine pumpkins. Such a creative post. Great healthy options! I had made a few of these over the years so thanks for reminding me just in time – the satsuma pumpkins are always a hit. I really appreciate this because all the other recipes I have seen are loaded with sugar and are unhealthy foods . The food ideas are great but the types of food are not what I would want to serve people especially young children. My daughter’s 3rd birthday is coming up and I prefer to have healthy options with maybe one or two sweet things like caramel corn and dirt cups. I totally agree with you. This is why I share healthy ideas for families. Thank you so much for your comment. Como pongo la pagina en español ?? You can use the google translator. Hope this helps. Puedes usar el traductor de google. Algunas computadoras lo tienen en automático.